In yesterday it rained salt, we are always surrounded by the acoustics of the sea. The beating of waves upon the shore and the receding ebb of the ocean water feels both transformative and evocative as we enter the space. Subsequently, they become the vehicle of our transportation, bringing us to a liminal island where one is powerless to inevitable change. We begin the narrative with Azman, portrayed by creative director Soultari Amin Farid, who has just returned to Singapore from studying overseas for some time. We see glimpses of the strained relationship he has with his father Man (Kaykay Nizam), as well as hints of his negotiation with his own identity. Man iterates the superiority of their islander heritage, and rejects the modern city – the “mainland”. The sea, he argues, is never very far away for him. But the sea is a stranger to Azman, who clumsily steers a makeshift sampan of bamboo poles, yet to achieve a confidence on the waters that comes naturally to his father. Azman’s departure from his own heritage forms a gulf that grows wider between the two as the play progresses. Although they inhabit the same space, they seem to be conversing with themselves instead of with each other. The atmosphere is further fraught when they do address each other directly, with the father almost always chiding his son with statements like “the sea won’t wait for you”, “you need to respect the sea”, and “don’t forget your roots, you’re a child of the island”. 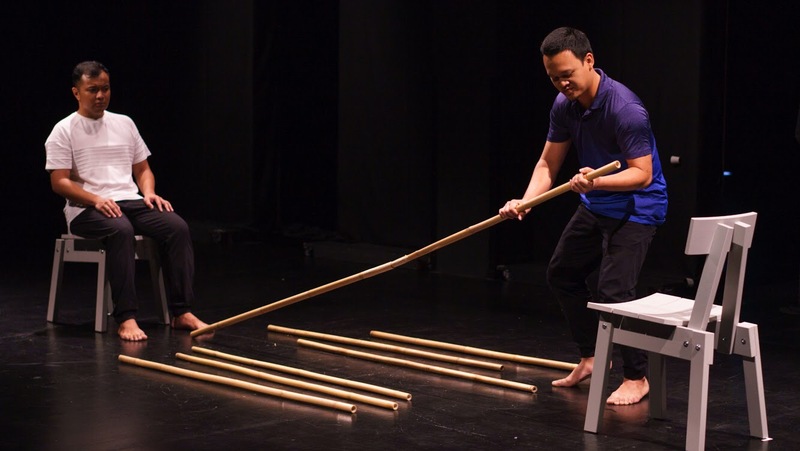 Woven in with these barbed exchanges are physical sequences choreographed by Norhaizad Adam, involving a number of bamboo poles and two wooden chairs, that expand on their father-son relationship. 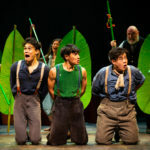 One sequence depicts them playing a variation of the children’s game red light green light, where they playfully endure each other’s antics, harkening back to a simpler time, while in another, Azman observes his father dismantling the sampan pole by pole, and attempts to repair the damage Man has caused, failing nevertheless. Through these sequences, the duo come to rely on each other, oppose each other, argue with each other and assist each other, embodying in the physical what is left unsaid. The many gestures and ruminations of Azman and his father also evoke the spiritual: at one point Azman seems to embody the sea herself, performing a series of movements derived from traditional Malay dance (the area of Amin’s expertise), while his father meditates on the sea’s contradictory nature, likening it to a “restless lover”. Yet the choreography resonated much more strongly with me than the accompanying text. 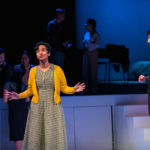 It seemed to convey the play’s thematic ideas well on its own, and characterise their relationship with far greater nuance than what the writing provides: Kaykay and Amin amplify its symbolic weight in the careful orchestration of each gesture and glance, nuances strangely lacking in the dialogue alone. On the other hand, as the text veers into the personal, I find that it sacrifices the spectator’s attention to the dynamics of the characters themselves. It was these moments that had less of an impact on me. A particular scene close to the end of the play pits father and son against each other in a series of verbal miscommunications: they debate whether the phrase goreng pisang (bananas fried) really ought to be pisang goreng (fried bananas), and then Azman lists foods that he has eaten, such as spaghetti aglio olio; his father, displeased, states that it is food for westerners. We get a sense of the conflict, that even though Azman is tethered to his islander lineage, the time he has spent away has ultimately changed him in his father’s eyes, who refuses any form of intimacy with his son. But I wanted, in particular, to know more about the individuals themselves, other than fragmentary allusions to their identity. The piece references other unknown characters as well, such as Azman’s mother and the late Uncle Sa’at, but does not provide us with a lot of information about their respective relationships and their significance, so we are left grasping at straws as to the exact influence they had on our two protagonists, or any possible cause of Man’s resultant behaviour toward his son. Furthermore, the text vacillates between the specific and the poetic, going from sentences that point to the unexplained roots of familial discord, to philosophical verses like “earth is our skin, plant is our hair”, which felt cumbersome and unwieldy over time. It could be that this was entirely the intention of yesterday it rained salt, and I could appreciate the emotional undercurrents of the text and the restrained nature of its approach. Nevertheless, I found myself strangely alienated from the work. Towards the end of the performance, as Azman and his father construct a bonfire, the continuous characterisations of the sea begin to feel laboured and repetitive, as well as the pithy revelations they come to. “The sea will wait for you”, “you have to be at peace” and “in the end, we are wrapped with a white cloth” – these small epiphanies feel weightless without an understanding of the stakes at hand, and neither do the depth of emotion related to mortality nor the development of the father-son relationship over time. These themes of spirituality, identity and distance are familiar ground for Bhumi Collective, whose work often concerns itself with displacement in many forms, but its intersections with mortality and suffering felt obscured to me, and I found it especially difficult to draw connections between the disparate text and gestures, which seemed as though they were working toward differing ends. As I walked out of the theatre, I considered the characters of Man and Azman, who remained strangers to me, atop a wealth of unanswered questions. The tools employed throughout the piece, from P. Ramlee’s moving getaran jiwa to Amin’s intricate dance movements embodying the spiritual Sea, were potent at first, but these never quite seemed to cohere in a manner that felt comprehensible, instead placing perhaps a heavy impetus on the viewer to fill in gaps between the explicit text and the abstract movement. These gaps felt a tad too plentiful to me. In many ways, yesterday it rained salt feels reflective of Man himself: an island, enigmatic, complex, fiercely responsive and in flux, and I left the theatre feeling as though I were at sea, being overwhelmed by walls of waves. 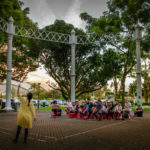 yesterday it rained salt by Bhumi Collective is written by Nabilah Said and choreographed by Norhaizad Adam and was staged on 19 January 2019 at Esplanade Annexe Studio as part of the M1 Singapore Fringe Festival 2019. 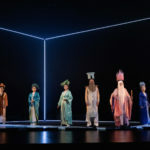 This review is based on the performance staged at 4pm on 19 January 2019.